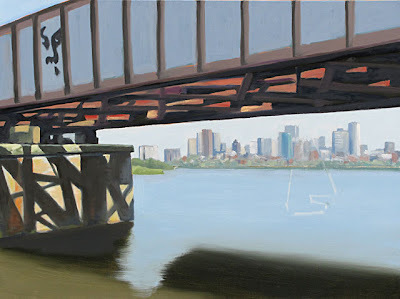 I’ve started a 16” x 20” canvas of my BU Bridge field study from last summer. What drew me to this view was how the airy, cool, and idyllic river with sailboats was framed by the hard, contrasty, warm tones of the rusting, grafitti-covered railroad bridge, and how the battle between the two played out in the reflections in the water. I gravitate to such contrasty images (you won’t find me doing too many fog paintings), but maybe they’re not to everyone’s taste. 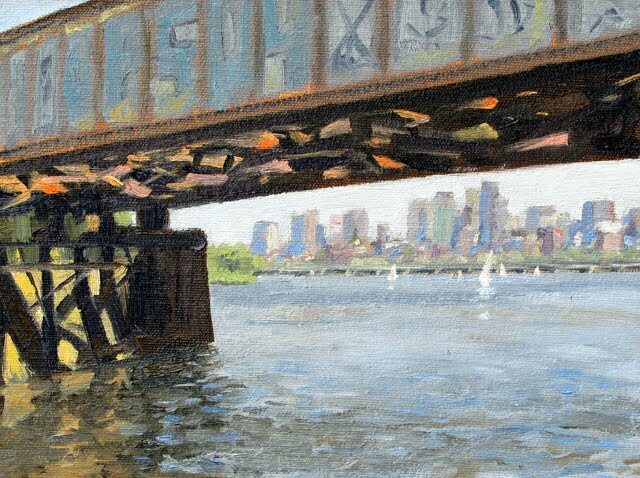 I visited the location in Boston twice last year to get the palette recorded in my 8” x 10”study. I had a good deal of pruning to do of the trees and shrubs at the river’s edge to get even a semi-unobstructed view (don’t tell anybody it was me). I always pack a pair of loppers in my car for the occasional branch that’s in the way, but this area needed a lot of work! I don’t know what the people riding and running by thought I was doing, but at least one shouted, “Thank you.” I think she thought I was making it easier for bikers to see around the curve. Since the reflections in the water are dependent on the landscape I plan to do the water last (I have just roughed in the colors here). I started the bridge with a wash of cadmium orange so that the overall effect will be warm. You can see that I have lightly outlined where I am going to place the closest sailboat. This boat is going to appear dazzlingly bright compared the massively dark bridge, so this will be my focal point. I will include at least a few more distant boats to create depth in the scene. I guess a third theme in this painting would be — triangles!